July traditions, for me, include vacations, swimming and barbecues. And salads, of course. Growing up in Louisiana, my grandmother harvested tomatoes and cucumbers from her “victory garden” and used them right away in a salad—what we called “summer in a bowl.” Combined with an icy glass of tea, these juicy veggies helped to keep us cool, hydrated and satisfied. Four summer salads in particular represent my Cajun and Cuban roots. Perhaps because of the citrus in most of them, you can’t help but feel bright and healthy after eating them. They will keep you cool when the temperatures outside make it too hot to cook indoors. Plus, they pair wonderfully with fresh fish. I hope you enjoy these traditional family salads and learn something old while trying something new. As a child, I knew it was summer when my grandmother could pluck ripe tomatoes and cucumbers off the vines in the early morning and serve them for lunch, unadorned by lettuce. 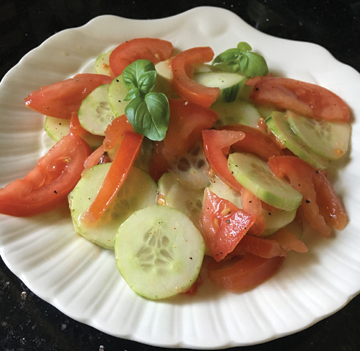 The freshest, vine-ripened Creole tomatoes and cucumbers didn’t need the fanfare, just a dash of salt and pepper, a splash of white wine vinegar and a good drizzle of Spanish olive oil. And, if you have it, add a couple of sprigs of fresh basil. Slice tomatoes and cucumbers. Salt and pepper to taste, sprinkle with vinegar and drizzle good-quality olive oil as you like. Toss, let sit for 5 minutes. Serve into bowls and eat. One stormy summer day when I was 8, I watched Julia Child on PBS thinly slice a mysterious “frondy” topped bulb, then toss it in a bowl with lemon juice, olive oil, salt and pepper. I begged my mom to take me to the market to find this vegetable called “fennel” in hopes of replicating that salad. Hint: The smaller the bulb, the tastier the salad. Also, if fennel has its fronds, cut them off at the base of the stalks and use to stuff grilled/roasted fish or chicken, or add to broth. Rinse and dry bulb. Trim brown spots. Cut the bulb in half from root to stalk. 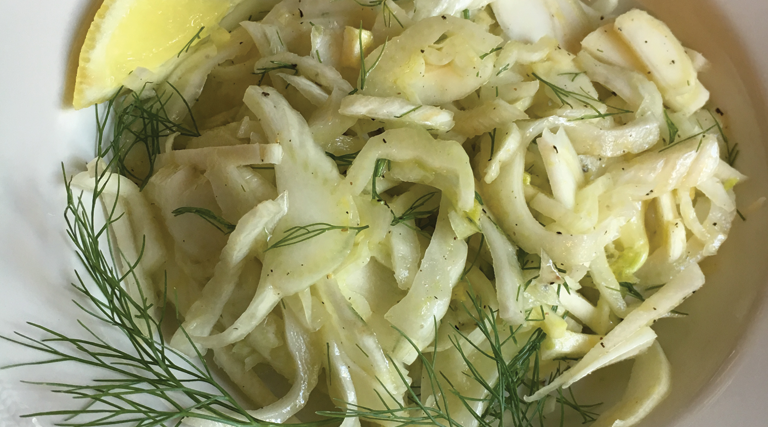 Using a sharp knife, slice the fennel thinly. Drizzle with lemon juice and oil, toss, then salt and pepper to taste. Serve immediately. I can’t imagine summer without this fun salad. The sweet-and-sour ingredients are perfect for any barbecue. It’s important to salt the dressing—and I mean overly salt it—because that mellows the sweetness of the pineapple. This salad does not hold well, so prepare it and serve right away. Combine oil, vinegar, juice, sugar, salt (overly salt if possible) and pepper in a blender until smooth. Lightly toss the lettuce, pineapple and red onion together. Add dressing a little at a time and toss to reach desired flavor. Garnish with avocado slices seasoned with salt and pepper and squeeze ½ a lime over each serving. Just like flan for dessert, this salad was always on the table at my in-laws for every holiday, funeral and celebration. The crunch of the iceberg lettuce is its magic. 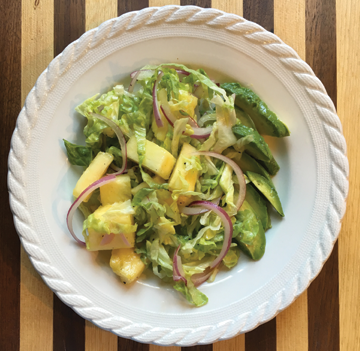 This salad is savory and satisfying with the tangy olive oil vinaigrette plus the umami of Worcestershire sauce. Use the best quality olive oil and cheese and prepare to be surprised. 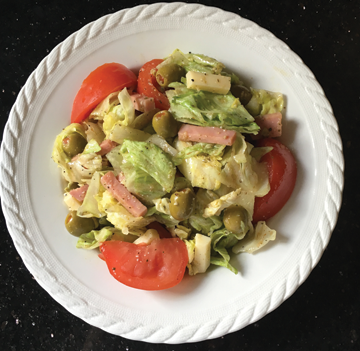 Combine lettuce, tomato, ham, Swiss cheese and olives in a large salad bowl. Before serving, add 1905 Dressing, Romano cheese, Worcestershire and the juice of 1 lemon. Toss well and serve immediately. Makes 2 full salads or 4 side salads.